New for July 2007! This page was entirely contributed by Kerry from Down Under! Engineers, whether the microwave variety or otherwise, owe a great deal to Hurley Smith; he invented the pocket protector. Hurley was an electrical engineer who became concerned at the adverse effect that pens, particularly the leak-prone ones of the '30s & '40s, had on the pockets of his white shirts, the de rigeur dress for engineers of the time. 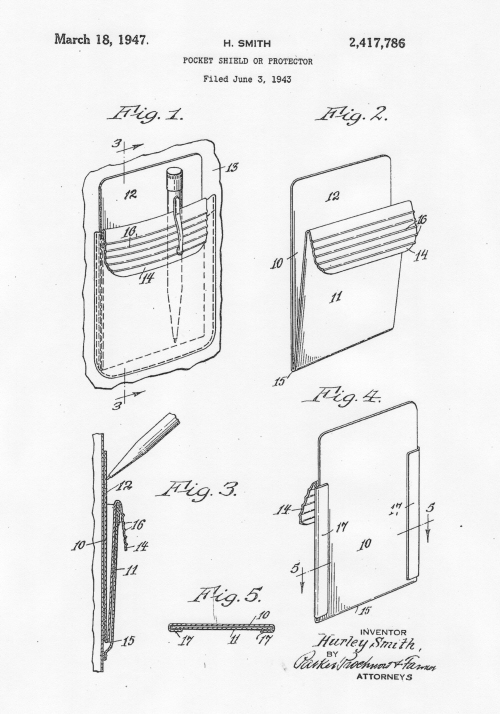 Finding himself unemployed, Hurley experimented with the then-new-fangled plastics and produced the first pocket protector. It was a runaway success and soon outgrew its home-based factory. He patented his invention; United States Patent No. 2,417,786 was granted in 1947. Hurley Smith went into the plastics business in Lansing Michigan in 1949. Whilst its mainstay was pocket protectors, the business manufactured other plastic products. Although the company was never large, R&D, in the best engineering tradition, continued; later protectors were made from vinyl and, ultimately, protectors were embossed with company logos etc.